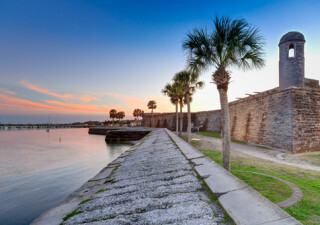 You and your loved ones can enjoy exploring beautiful, historic downtown St. Augustine and become a part of the unique tradition of firing the cannons at the Castillo de San Marcos. Every weekend, this fort on the bayfront holds reenactments of what it was like living as a Spanish colonial settler, which includes actors in period dress and weapon demonstrations, like the cannons which were fired when the fort was under siege. Admission to the Castillo de San Marcos is $15 per adult, but children 15 years and younger are free. The cannons are fired from the gun deck on Friday, Saturday, and Sunday at 10:30 and 11:30 a.m. as well as 1:30, 2:30, and 3:30 p.m. Although you can see the cannons firing from outside of the fort, it is truly worth your while to visit the inside to get the real scoop on St. Augustine history from real historians and park rangers.